Posted on Tue, Mar 15, 2011 : 8:24 a.m.
A University of Michigan-led clinical stem cell trial for Lou Gehrig’s disease is poised to take an important step forward. 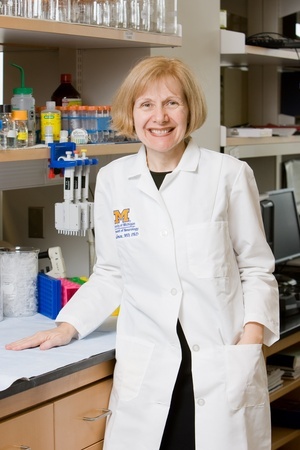 The trial, led by University of Michigan neurologist Eva Feldman, has been evaluating the safety of injecting millions of stem cells into patients’ spines, The Detroit News reports. Next, the trial will begin testing the safety of the procedure in the part of the spine that could save lives, according to The News. Amyotrophic Lateral Sclerosis, also known as Lou Gehrig’s disease or ALS, is a neurological condition that robs its victims of their ability to speak, move and eventually breathe, while leaving their minds alert. Roughly 30,000 Americans are afflicted with the disease and 5,600 diagnosed each year, according to the ALS Association. The study is being conducted at the Neuromuscular Laboratory at Emory University in Atlanta with Feldman on board as a consultant to Neuralstem Inc., the trial’s sponsor. Tue, Mar 15, 2011 : 2:37 p.m.
Bravo Dr. Feldman! I hope these trials have a positive outcome. My mother was an MD who had ALS for 8 years - it's a terrible, terrible disease with no real treatments beyond trying to make the patient more comfortable. Thank you for you and your team's hard work!